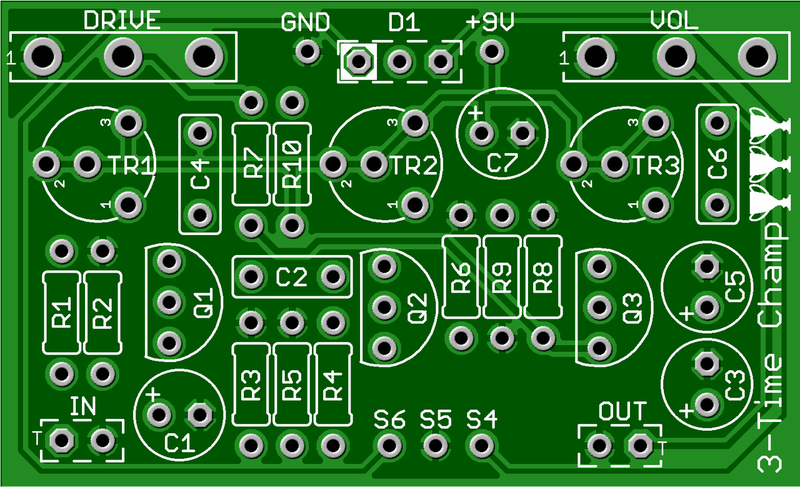 This kit includes all of the parts needed to build the GuitarPCB 3-Time Champ Overdrive project. With the completed pedal, you can go from clean boost to powerful overdrive! This project stacks three Fetzer (ROG) based circuits with the right combination of FETs , biased to perfection yielding a big Champ™ style tone out of your amp without needing to crank the amp itself. It is easily moddable to taste, to suit your own rig. Kits with bare enclosures ship with cream Davies 1510-Style knobs. Kits with white enclosures ship with black knobs of the same style. Kits can be ordered with either a 125B or 1590B enclosure. The slightly larger 125B is recommended for beginners. Champ™ is a trademark of Fender®. Pedal Parts and Kits is not associated with and makes no claims to these trademarks. See our FAQ for more details. Check out this demo by Garland Guitar Services!